Facebook is testing a new feature that lets users “highlight” their important posts, making them more likely (but not guaranteed) to appear in their friends’ feeds. This is a fantastic idea. I can’t begin to count how many of my status updates have failed to get even a single comment or like. The only possible explanation is that people aren’t seeing them; this new feature would fix that. Facebook will create a fictitious “friend” for you who will post flattering comments and likes to your status updates, photos, and links at random intervals. $6 / Imaginary Friend™ / month; 10% discount on orders of more than 4. One of your Imaginary Friends™ will post a message of your choosing to your wall. Popular selections include “You look great! Have you lost weight?” or “I know you don’t want anyone to know it’s your birthday, but HAPPY BIRTHDAY!!!”. $4 / post; only available to people who have at least one Imaginary Friend™. An excerpt from my Facebook timeline. The circled posts are the ones that I’d highlight. Only about a dozen of the updates I post each day are super-important, and I think I could probably get by with just the basic highlighting. So for just $24 / day — about what I spend on my daily half-dozen coffees at Starbucks — I can make sure my friends are somewhat less likely to miss my most significant news. Thank you, Facebook; this is just what I (and my friends) needed. I’m going to be moving this blog to a new server, probably around May 26. If you use an RSS reader, have the site bookmarked, or come in through a static html link (like a blogroll), , or if you do NOT have a wordpress.com account, then you shouldn’t notice any difference. But this blog will no longer be available through the wordpress.com reader, nor will it be sent via mail to people who signed up using wordpress.com accounts after the move, so if that applies to you, please switch to one of the other methods. Please, please switch. This blog will be a sad and lonely place if you don’t come with me. But, you know, no pressure. Ah, already I’ve saved at least $24.00 a day by giving up Facebook last year! You got it! Actually, #1 was both things (two impossible comments). Riveting FaceBook updates! I can’t imagine why you didn’t get a flurry of responses from all your friends to those posts. Totally love the Imaginary Friends option – at $6 a month that’s actually quite a reasonable price. Will they also tag you in pictures with themselves? That should be interesting to see! 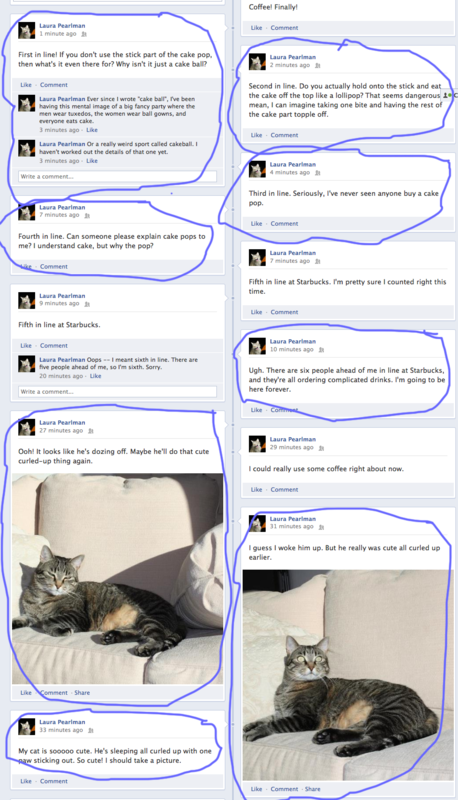 If I didn’t drink six coffees every day, I wouldn’t be able to check Facebook all night. That’s a good question about tagging — I’m guessing that will be an option. You’ll also be able to specify some guidelines about how the appearance of each Imaginary Friend™ when its created, to make sure you look as attractive as possible when standing next to them. This is priceless! Hilarious! There’s nothing I like more than a good mocking of the ridiculousness that Facebook is. Of course, they feed right into the savage desire of millions of people who want some attention – any attention at all. And I love your Facebook posts chronicling your spot in the queue. Thanks. Cake pops really are a mystery to me. Wait…this is mockery of ridiculousness? Damn! I just sent my credit card info to get the Deluxe Imaginary Friend Wall Posts option. Facebook, you got some ‘splainin to do! And it is NOT a breech of all laws of common decency to post a status update every 30 seconds you are in line at Starbucks, no matter what anybody says, so you go, girl! – Third in line at Starbucks. – Still third in line at Starbucks. You might also want to purchase Friend Agent™ for yourself — it’s an app that will post positive-sounding comments and likes that appear to be coming from you on your friends’ posts. It’s great for those times when you want to appear to care more than you actually do. You might want to Mega Highlight the announcement about your blog moving to a new server. Otherwise, you might have to invest a lot in Imaginary Friends wall posts and/or blog comments in the future. Thanks — I’m taking your advice and doing the bloggy equivalent. MySpace is like the Sun in that you should never look directly at it. And lets not forget about Facebook premium service of NOT making some of your posts and photos visible to public. Blackmail, premium service — you say tomato, I say tomahto. Classic. You should contact Zuck about doing sales for him, because now this TOTALLY makes sense! And thanks for the reminder about the box – I have sooooooo many emails from commenting on blogs this week! The box is what pushed me over the edge and convinced me to move off wordpress.com. Awww, thanks. I’ll send you my line-position-in-Starbucks updates via email. Where can I sign up to play cakeball? Do you have your own cakebat? Your $2 is in the mail. Hmm. The scary thing is, FB would do this and people would pay for it!! That would be the end of it for me. I guess they’ve got to start producing some serious income if they’re going to justify how much their stock is supposedly going to be worth. So, by not being on Facebook, I’m saving you money? You are welcome. I would like to pay for my imaginary friends with my imaginary money. Do you think that would work?